"I have trained in the way of strategy since my youth, and at the age of thirteen I fought a duel for the first time. My opponent was called Arima Kehei, a sword adept of the Shinto ryū, and I defeated him. At the age of sixteen I defeated a powerful adept by the name of Akiyama, who came from Tajima Province. And at the age of 21 I went up to Kyōtō and fought several adepts of the sword from famous schools, but never lost." Clearly from a young age he was naturally gifted in the art of sword fighting. After arriving in Kyōtō his fame grew and events of his life began to be recorded. At the time, there were eight highly respected warrior academies in Kyōtō and the most highly regarded was the Yoshioka School. The head of the school was Yoshioka Seijūrō. Musashi challenged him to a duel and Seijūrō accepted (we don't know the circumstances that led to the challenge, we can only speculate). It was agreed beforehand that it would be a "friendly" duel, that is, non-lethal. 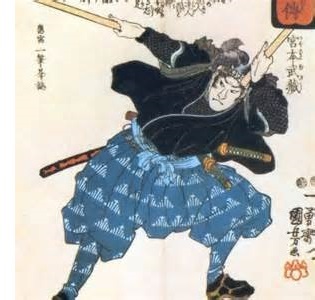 The two would fight with wooden staffs (called a Bō) and the first to land a successful hit would be the winner. In addition to his skill, Musashi was a master of psychology. He arrived at the duel late which was considered an insult to the opponent. This outraged Seijūrō, which obviously was Musashi's intention. When the fight began, both warriors struck. Musashi's blow landed, but Seijūrō's did not. But Musashi's strike landed with such force that it knocked Seijūrō unconscious and broke his left shoulder, crippling him permanently. His days as a samurai were over. His younger brother, Denshichirō, became head of the school and was considered as good a warrior as Seijūrō. He quickly sought revenge and challenged Musashi to another duel, this time to the death. The fight took place outside the Sanjūsangen-dō temple. Once again Musashi arrived late and again he was victorious. This time Denshichirō was killed. Now the entire Yoshioka family was furious and conspired to kill Musashi. The last immediate male member of the family was twelve year-old Matashichiro (roughly the same age Musashi was for his first fight). He challenged Musashi and Musashi accepted. But it was a trap. The Yoshiokas gathered other family members and students of the academy and armed them with the intention of overwhelming and killing him. Musashi caught wind of the plot, but did not pass on the duel. Instead he arrived early (as opposed to his usual routine of arriving late) and hid in the brush near the Ichijō-ji temple where the fight was to take place. When Matashichiro arrived, Musashi lept from the bushes and quickly struck him down. The shocked attendees drew their weapons and attacked. Musashi managed to fend them off and escape. But he was forced to draw a second sword and fight two-handed. This was considered the beginning of his two-handed fighting style which became known as niten'ichi-ryū, a technique he presents in his Book of Five Rings. In the process, he single-handedly destroyed the most prestigious martial arts school in Kyōtō. From there, he traveled to Enkoji Temple in the Harima Province to study with Buddhist monks who were considered experts in lance warfare. After that, he began traveling the countryside and became a rōnin (samurai for hire, not in the employment of a daimyo). His most famous fight, and the one that cemented his reputation as the greatest swordsman in Japanese history, came in 1612 against Sasaki Kojirō. Both men were thought to be roughly the same age (in their late 20s), but if anything Kojirō was the more renown warrior at the time. He was known as the "Demon of the Western Provinces" and fought with a special sword known as a nodachi. Musashi knew of Kojirō's reputation and traveled to his homeland to meet him. The two agreed to a duel on an island in the Kanmon Straights between the large islands of Honshū and Kyūshū. On the morning of the fight, Musashi resorted to his old tactic of arriving late. When he arrived by boat, he jumped out early and waded ashore in bare feet carrying a bokken (a wooden sword he supposedly carved from one of the boat's oars). 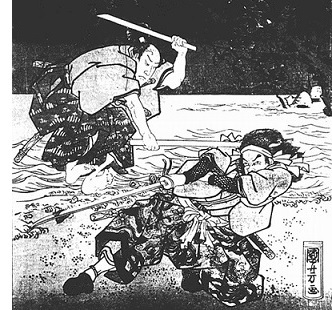 Kojirō was upset at Musashi's late arrival and hurled insults at him. Musashi then goaded Kojirō into striking first. The swing apparently came so close that it actually scraped Musashi's hair (without splitting his skull). Musashi managed to counter though and avoid being cut. There are several accounts of the fight which vary from one to the next. So an exact recreation is not possible. But Kojirō was thought to have come close to victory on several of his shots, only to have Musashi avoid being struck each time. One account says that Musashi skillfully positioned his body so as to have the sun behind him, thus obstructing Kojirō's vision. After several minutes of exchanging blows, Musashi managed to find an opening and landed a thrust to Kojirō's left ribs, breaking them and puncturing his lung. Kojirō took one last swing as he fell, but missed and died shortly thereafter. Musashi quickly jumped back into his boat and his men rowed away before any of Kojirō's supporters could avenge his death. However, upon looking back at his fallen opponent, he was said to have been filled with such remorse at the loss of such a great swordsman that he refused to participate in duels ever again (although he continued to fight in field battles).